North-eastern Brisbane. 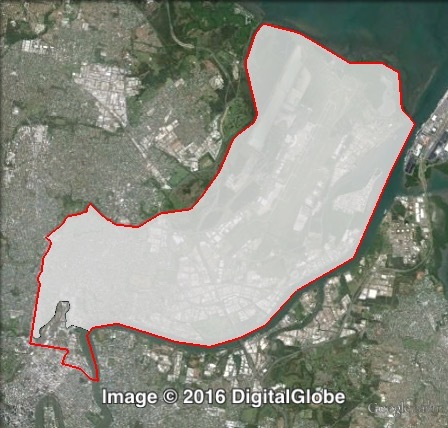 Hamilton covers suburbs immediately to the north of the Brisbane river and to the north-east of the Brisbane CBD, as well as Brisbane Airport. 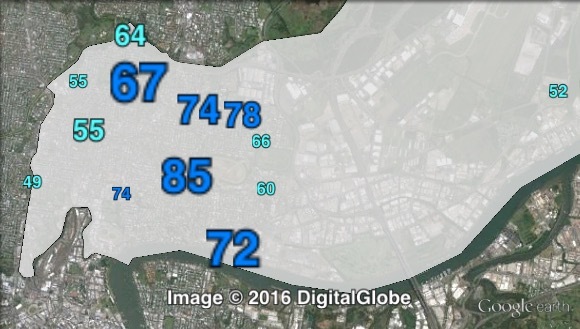 Suburbs include Clayfield, Hendra, Albion, Ascot and Kedron. Map of Hamilton’s 2012 and 2016 boundaries. 2012 boundaries marked as red lines, 2016 boundaries marked as white area. Click to enlarge. 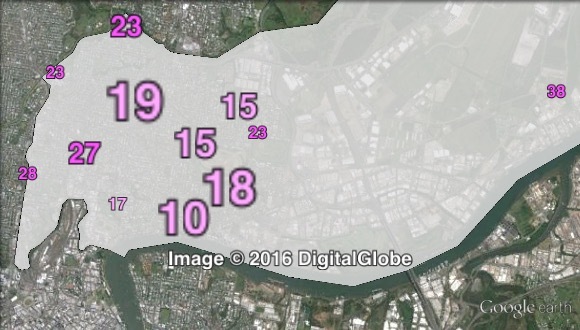 Hamilton lost Bowen Hills and Newstead to the Central ward, at the south-western edge of the ward boundary. These changes increased the LNP’s council margin from 24.4% to 24.6%, and the mayoral margin also increased from 26.7% to 26.9%. Liberal councillor Tim Nicholls won Hamilton in 2000, and was re-elected in 2004. He resigned in 2006 to run for the state seat of Clayfield, which covers a similar area, and won that seat. Nicholls still holds his state seat, and served as Treasurer in the LNP government from 2012 to 2015. The 2006 by-election was won by Liberal candidate David McLachlan. He increased his margin from 14.7% (2004 results on 2008 boundaries) to 20.4% in 2008, and further to 24.4% in 2012. Hamilton is a very safe LNP ward, and McLachlan should be easily re-elected in 2016. 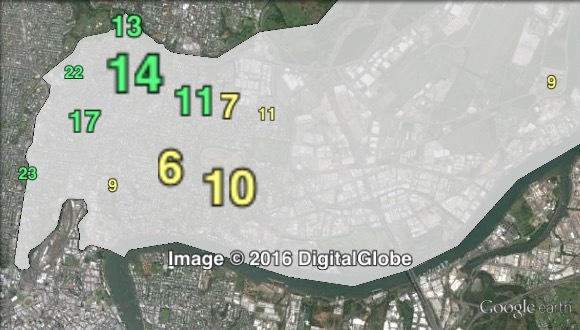 Polling places in Hamilton at the 2012 Brisbane City Council election. Central in green, East in orange, West in blue. Click to enlarge. Booths in Hamilton have been split into three parts: central, east and west. The vast majority of voters in Hamilton ward, including all but one booth, lay at the western edge of the ward. 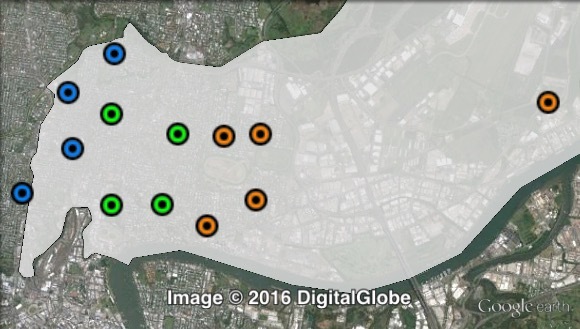 The booths in this area were split into three parts, and Pinkenba ward, closer to the airport, was added to the ‘east’ group. The LNP’s council primary vote ranged from 57% in the west to 75% in the centre. The ALP’s primary vote ranged from 15% in the centre to 25% in the west, while the Greens vote peaked at 17.6% in the west. Liberal National primary votes for councillor in Hamilton at the 2012 Brisbane City Council election. Labor primary votes for councillor in Hamilton at the 2012 Brisbane City Council election. Greens primary votes for councillor in Hamilton at the 2012 Brisbane City Council election.